Cine film transfer to digital. 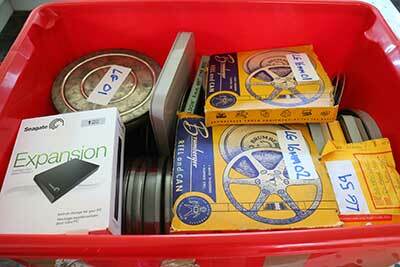 We are currently transferring a large amount of 8mm and 16mm cine film transfer digital. Once the cine film to digital transfer is complete the video files will be sent to the production company for editing into a documentary alongside HD video that they are producing. Using Adobe premier on the Mac platform. All the cine film transfer to digital are captured using HDMI inputs on our Black Magic Design hardware. This ensures the highest quality conversions of 16mm and 8mm cine film to digital. All cine conversions will be checked for colour balance and broadcast safe colours. Because the final content will be used for a TV broadcast The output cine film to digital files will be at 50 Mb per second in accordance to broadcast guidelines for High Definition. Our cine film transfer digital files will be kept on our servers for 6 months as a safety back up in case the hard drive supplied to the client or supplied by us fails. As well as transferring 8mm and 16mm cine film to HD video files for the Apple Mac platform, we also provide a cine film to digital video file service for the PC Windows based computer platform in the form of AVI or Mpeg4 video files. File sizes for video editing. For a standard definition scan of your cine film the average file size in AVI or Quicktime is 900 MB for 50ft of cine film. High Definition scans vary in files sizes depending on the type of file used. For the ultimate in hard drive speed and storage we recommend CalDigit drives and enclosures. For more information about our cine film to digital service click on the link below.